Botanical Name: 1. Clematis chinensis Osbeck; 2. Clematis hexapetala Pall. Part Used & Method for Pharmaceutical Preparations: The roots, or rhizomes, are dug and gathered in autumn and then cleaned and dried in the sun. Properties & Taste: Pungent, salty and warm. Functions: 1. To dispel wind and damp; 2. To promote the circulation of meridians. 1. Wind-damp obstruction syndrome manifested as rheumatic pain, soreness, pain and numbness in the joints and motor impairment. 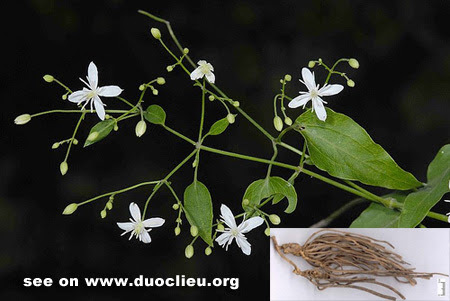 Clematis root (Weilingxian) is used with Pubescent angelica root (Duhuo), Mulberry mistletoe (Sangjisheng) and Chinese angelica root (Danggui). 2. Fish bone stuck in the throat. The decoction of the herb is taken orally with vinegar. Cautions & Contraindications: This herb is contraindicated in a person with a weak constitution.